When studying the effects of drugs, there is often a large gap between pharmacological responses seen in various in vitro (cell-free, cell-based) assays and clinical response. We aim at closing these gaps by mathematical modelling, so that (in vitro) testable responses can be translated into clinical practice. For HIV, we are particularly interested in predicting the clinical effectiveness and effectiveness in the context of prevention (treatment for prevention, pre-/post-exposure prophylaxis), to anticipate effectiveness against resistant strains and consequences for resistance spread. Our workflow starts by building direct response models, which relate target inhibition to drug concentrations at the target site (see e.g. von Kleist et al. 2012). The models can typically be parameterized by in vitro data. Target inhibition can be related with clinical efficacy in complex ways, requiring to couple and validate complex systems biology models ( see von Kleist et al. 2010). We then establish the link between target site concentrations of the drug and measurable plasma concentrations (e.g. von Kleist et al. 2007, Duwal et al. 2012, Duwal et al. 2016). 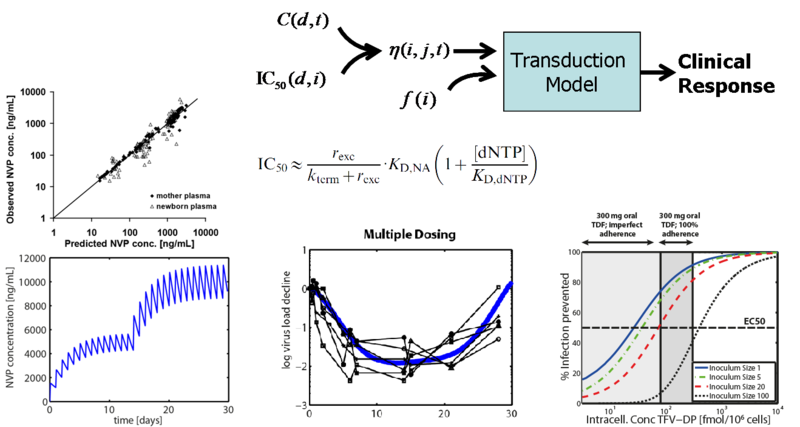 Combining the two (systems biology models of drug action & target-site pharmacokinetics) subsequently allows to predicting clinical outcomes based on drug dosing, and to validate the models using distinct data sources, see e.g. Frank et al. 2011 and Duwal et al. 2016. Finally, if all intermediate steps are sufficiently validated, the mechanistic models allow to assess untested clinical treatment scenarios, to interpret clinical trial results mechanistically and evaluate the impact of various molecular- (resistance, cell-specific efficacy) and behavioral factors (e.g. adherence) on clinical efficacy, see e.g. Duwal et al. 2016. When drugs are used to prevent disease transmission (treatment for prevention, pre-/post-exposure prophylaxis), this modelling workflow can be used to assess and understand the epidemiological impact of such strategies.